Located in the scenic southwest corner of Oregon, Jackson County is home to a growing population of more than 200,000 residents—a growing population that in recent years has produced both a higher demand for services and more public records. Like many local government offices, Jackson County was flush with paper documents and short on storage space. Additionally, the county must store and organize most of its departments’ records in complex records structures according to state and federal laws for records retention. With paper records, enforcing retention schedules while ensuring staff could still find and retrieve records involved tedious manual steps for staff across the county. Even though the county knew its departments needed an enterprise content management (ECM) system, skepticism toward digital content—and new IT projects—was strong among employees. “It was a hard fight to get ECM implemented in the county. People were thoroughly entrenched in their paper processes,” says Goble. To offer a valuable solution to staff, Goble led a search for an ECM system that could satisfy many different users’ needs and eliminate manual paper processes. Laserfiche appealed to the IT department because it offered a well-supported feature set with a solid, built-in records management component. After hearing the positive experiences of other cities and counties using Laserfiche, Goble was assured that his IT department could structure Laserfiche in a way that would win over skeptical departments. Although many departments wanted a solution to their paper problems, the county began its Laserfiche implementation in the Sheriff’s Office in 2011. The diverse types of records handled by law enforcement staff offered the perfect testing ground for an improved records management process. Felony records, for example, must be retained by the department for ten years, while records managers can destroy certain types of warrants after five and others after ten. Keeping track of different retention schedules while making paper documents easily accessible to clerks was difficult for the department. Laserfiche’s Records Management Edition, a DoD 5015.2-certified records management solution, allowed the IT department to separate what Goble calls the “nuts and bolts of records management” from general document use. Using Laserfiche’s transparent records management approach, the department was able to customize content management based on staff members’ job functions and easily organize the same documents in different ways for records managers and deputies. For example, the four types of warrants handled by the department all require two separate retention schedules. When a warrant is received and scanned into the department’s digital document repository, Laserfiche automatically puts every warrant in its own record series folder, allowing records managers to view warrants in a batch by type or year and purge them at the appropriate time. At the same time, Laserfiche establishes a separate folder structure for deputies and clerks that lists individual warrants by warrant type and warrant number. Because deputies are usually searching for more granular information within a specific case or a subpoena, Laserfiche automatically organizes documents so that deputies can easily find the detailed case information within a record. It’s a best of both worlds solution: records managers can easily find and filter warrants based on disposition schedules while, at the same time, deputies can access individual warrants without knowing anything about records naming conventions. Everyone can work with law enforcement documents in the manner they prefer. 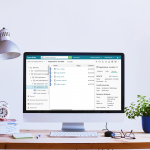 “Laserfiche’s transparent records management tools allow us to create a second view of the data in as many places as we need to. Records managers see it in one way. Clerks see it in another way. In some cases, others in the Sheriff’s hierarchy can see it in a completely different way,” says Goble. Furthermore, an integration between Laserfiche and Tiburon, the department’s CAD/RMS system, pulls relevant names, place and incident dates from the police records upon scanning. Laserfiche Quick Fields auto-populates this information as metadata within the warrant file. Laserfiche Workflow then routes the warrant through the transparent records management filing process, eliminating the time-consuming, manual data entry and document routing steps for staff. Laserfiche has also completely automated the department’s civil jacket process, which once included tedious data entry by records managers. For civil cases, deputies compile an envelope of documents called a civil jacket that includes court documents and other records related to an incident when a subpoena is served. When these envelopes are scanned into the document repository, Laserfiche automatically fixes the civil jacket number to comply with the state’s records policy and forwards the documents to clerks for quality assurance. “We take that act of moving data around and complying with retention policies out of users’ hands as much as possible. In some cases, users never have to touch the documents after they scan them. Laserfiche does all the rest,” says Goble. Eliminating manual steps helps staff focus on getting their jobs done instead of tracking down and organizing paper. Temporary staff can complete scanning tasks without needing to be trained on document retention parameters, and records managers aren’t burdened with data entry. Laserfiche’s automation tools also eliminate the security risk of records being moved out of their records series. “Not only do users not have to worry about where things go, they can’t change the filing structure even if they want to. This structure is locked in place by policy,” says Goble. Furthermore, the Sheriff’s Office can directly push documents to the District Attorney’s office using Laserfiche WebLink, an online Web portal that provides read-only access to documents. High-profile cases often require transferring thousands of pages of records to the DA. With WebLink, the Sheriff’s Office can upload select documents to the online portal and give DA staff secure access to the information, eliminating costly printing and shipping expenses and streamlining litigation. The initial implementation was so successful that the skeptical end users have started evangelizing Laserfiche to other departments. Goble says he is fielding questions from other departments about records management and Laserfiche all the time. “It’s nice to give users something solid. Now that our staff has had a chance to see what the product can do for us, they’re getting excited about it,” says Goble. In addition to using Laserfiche for other documents like purchasing records and contracts for the Sheriff’s Office, IT has expanded ECM to the County Assessor’s Office. The department uses Laserfiche to scan and store historical deed cards, 100-year old property assessment jackets and current personal property returns for local businesses. The county’s Human Resources department has also started integrating Laserfiche with its Oracle ERP system to manage personnel records. Using Laserfiche Workflow and Laserfiche Quick Fields to automate as much of the capture and indexing process as possible went a long way in showing the value of the application to multiple departments. Goble says that setting up a system that requires as little user interaction as possible was key to expanding ECM into an enterprise application. “I’m more proud of our users than anything else. We’re really happy to see the expansion that we’ve been able to do with Laserfiche,” notes Goble.